The marquetry donkey has sustained its popularity and usefulness in serious European marquetry workshops for over 400 years. Many specialist schools, in France and abroad, still train their students using the traditional marquetry donkey. 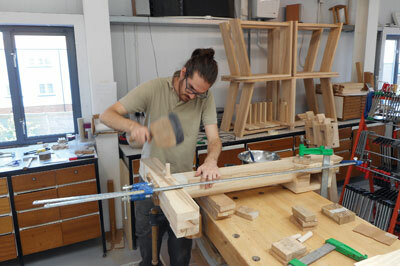 Additionally, some private workshops will use the marquetry donkey on a daily basis. Is this pure traditionalism or does the marquetry donkey still have a real place in the modern workshop? I was trained in the early 1990s using a marquetry donkey at the Ecole Boulle in Paris and I built my first donkey at the same time. Since then, I have explored other avenues, such as the electric jigsaw and laser cut marquetry, but the marquetry donkey is still my preferred tool. For me, it is available to use at all times; it combines precision, ease of use, speed and cost effectiveness. Beyond all else, however, it is very enjoyable to use. While the marquetry donkey today is gaining popularity in America and beginning to increase in use in France and Germany, it seems to have lost its place in the English workshop. The demise of the marquetry donkey in the UK has primarily resulted from changes in fashion and materials and today, few English makers realise its potential. In this article, I hope to persuade you to make some room for one in your workshop. What is a marquetry donkey? The French terms for the marquetry donkey are 'chevalet de marqueterie' or 'ane'. 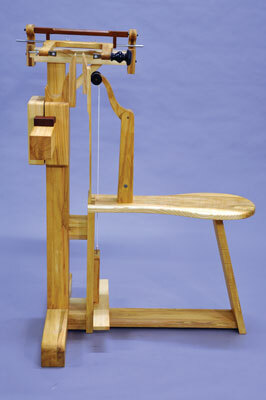 Essentially, the marquetry donkey is a foot-activated vice. Originally, the donkey was simply a vice fitted with a foot-activated quick-release mechanism. Over the years, it has been improved with the addition of a mechanically guided piercing saw. A marquetry maker, often called a 'marqueteur', with skilled hands and good eyes, can cut up to 12 marquetry designs at the same time and at a level of precision close to 1/10th of a millimetre. The donkey's usefulness is not limited to marquetry; it is a practical piercing saw, ideal for cutting any thin woods and veneers. The history of the marquetry donkey is closely linked to the development of the piercing saw, the invention of which has long been credited to silversmiths from the region of Augsburg. During the 16th century, Augsburg was a leading centre in the manufacture of luxury goods, including silver 'objets de vertues' and fine marquetry cabinets. 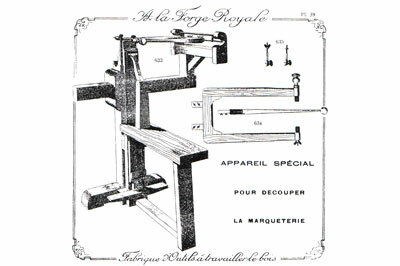 The piercing saw enabled the cutting and shaping of extremely small pieces of wood veneers. More importantly, for the first time since the development of inlaid decoration, metal and hard materials such as mother of pearl, ivory, horn and bone could easily be cut and integrated into marquetry designs. 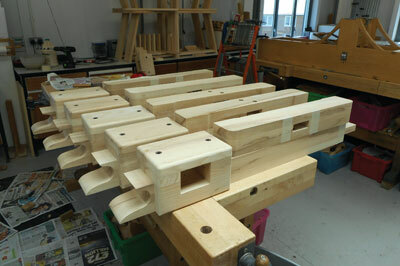 Even nowadays, the piercing saw remains the best way to cut these hard materials. The earliest known representation of a piercing saw is, itself, in a piece of marquetry, which has been used to decorate the end of a goldsmith's bench. This bench, on exhibition at the museum in Ecouen, north of Paris, is dated 1565 and was made by Leonhard Danner for Augustus I of Saxony. It is decorated with a series of marquetry panels, including one representing a marquetry workshop, supposedly the marquetry maker's own workshop. Hanging on the wall are a large traditional carpenter's saw and a very small piercing saw. A traditional inlay knife is proudly displayed on the marqueteur's bench and from this we can deduce that both the knife and the saw were in use concurrently. The earliest representation of a marquetry donkey is again on a marquetry panel, this time inside an extravagant cabinet known as 'the Augsburg Art cabinet', now at the Gustavianum museum in Uppsala, Sweden. Made by Philipp Hainhofer in 1632 for King Gustavus Adolphus of Sweden, the cabinet contains a marquetry panel portraying Hainhofer in his workshop. A marqueteur sitting at the donkey cutting marquetry can be seen in the background. 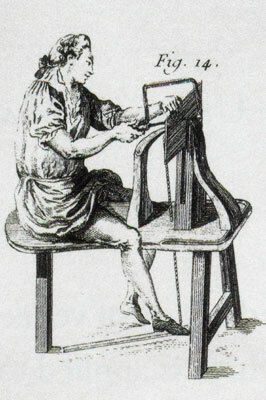 Over the next four centuries, shifts in fortunes and fashions, and the migration of craftsmen from one country to another, resulted in the dissemination of techniques across Europe. Historical evidence of the marquetry donkey can be found in Germany, France and England. Numerous publications, mainly in German and French, illustrate the marquetry donkey. The Andre Jacob Roubo 1772 Encyclopaedia offers the fullest description of a working donkey, including a detailed plan. The marquetry donkey appears to have remained unchanged in design and concept well into the 20th century when it can be seen illustrated in the c.1930 edition of the Roret 'Marqueterie' encyclopaedia. The first documentary evidence of the marquetry donkey being used in England dates from the second half of the 18th century but it is logical to assume that marquetry donkeys were introduced to Britain sometime in the 17th century, if not before. English marquetry benefited greatly from the immigration of Huguenot craftsmen at the end of the 17th century, taking a great leap forward with talented craftsmen like Gerrit Jensen and Cornelius Gole. 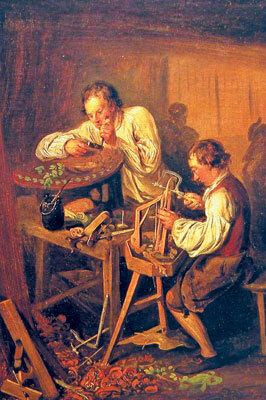 By the 18th century, marquetry techniques and tools had become standardised all over Europe. England was no exception and this is illustrated by Elias Martin's painting of a cabinetmaker's workshop, c.1770-80. 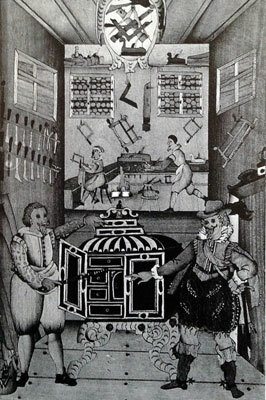 This painting, now in the museum of Stockholm, shows a marquetry workshop, believed to be that of Chippendale, to whom Martin may have had access thanks to his family relationship with Georges Haupt, a Swedish cabinetmaker working in England. Martin's depiction of a marqueteur's workshop is rich in detail, his keen understanding of technical workshops no doubt due to his being the son of a carpenter. It clearly shows a marqueteur cutting small pieces of veneer on the marquetry donkey while one of his colleagues inlays them into a circular tabletop. It is worth taking note of the bright green veneer offcuts at the feet of the marqueteur. This same bright colour would have graced the original marquetry, which have now turned brown and colourless. Marquetry techniques at the time, in Chippendale's workshop and in those of most of his European counterparts, were a mixture of piercing saw work and inlay. In its early versions, the donkey was little more than an upright vice. The piercing saw still had to be entirely manipulated by hand and this limited the size of the piercing saw itself and the size of the resulting marquetry. It was also impossible with a freely held piercing saw to cut with any degree of precision. These two significant disadvantages were addressed with the addition of a horizontal attachment that enabled the piercing saw to be guided mechanically, greatly improving the saw's precision and ease of use. It is currently believed that these improvements were developed in Paris at the end of the 19th century, with the earliest representation of the improved donkey appearing in French tool catalogues at the beginning of the 20th century. The improved donkey became a standard tool in Parisian workshops during the 20th century and all marquetry students at the Ecole Boulle in Paris have been trained on these donkeys since the opening of the school in 1886. Scalpel, knife marquetry, also called 'window marquetry' and described at great length in William Alexander Lincoln's book The Art and Practice of Marquetry, 1974, has become the most widely used technique in the UK. While great marquetry works have been produced by modern marqueteurs, in my opinion, this technique is extremely restricted in scope. Only thin and relatively soft veneers can be used, limiting the marqueteur's choice of materials. The colour palette of softwoods is constrained and, in order to extend the range of colours available, these softwoods are often artificially dyed. The piercing saw enables the marqueteur to cut hard and exotic woods, as well as materials such as metals, mother-of-pearl, horn, bone, ivory - now regulated - shagreen and even, more recently, CDs recycled and used as veneer. Additionally, scalpel marquetry can lack precision as the knife blade inevitably has a bevel edge, forcing the marqueteur to tilt it slightly to create a perpendicular cut, which requires great expertise to avoid leaving unsightly gaps between elements. The piercing saw produces a straight cut, which enables each marquetry element to seamlessly abut its neighbour. Laser marquetry has gained popularity within the furniture industry since its invention at the end of the last century. One of the main advantages of laser marquetry is the almost unlimited size of the marquetry produced, thanks to ever newer and bigger laser cutting machines. But, as the size of the machine increases, its cost inevitably follows. The initial investment in a laser marquetry setup is very high and, as a result, marquetry produced by laser remains expensive. Additionally, CAD design is time consuming and requires specialist knowledge and therefore added expense. Laser cut marquetry is not yet financially available or viable for the amateur or for the small maker of bespoke pieces. The only way to reduce the cost of laser marquetry is to increase the number produced but, for me, the artistic nature of marquetry does not fit the ethos of mass-produced works. At its best, marquetry is an art form that pays tribute to the beauty and intrinsic complexities of wood and variations from piece to piece are symptomatic of the medium. Another major disadvantage of laser marquetry is the slight burning of the edges of the veneer. It is particularly noticeable on light coloured veneers: if two pieces of light coloured veneer are placed next to each other, the burnt edges will make a rather unsightly darker line. Laser marquetry certainly has its place in the future with increasingly cheaper equipment and ease of using CAD, but the question remains as to whether the essence of marquetry making, the hands-on choice of woods and effects, is not lost through using a computer? 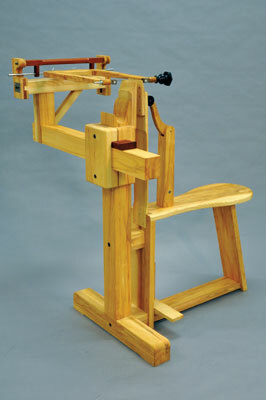 The best contender to replace the marquetry donkey has been the electric piercing saw. This still permits the marqueteur a high level of hands-on control but mechanises the labour increasing efficiency and output. Many exist on the market but only a few combine quality of cutting with minimal vibration. The most reputable machines are those made by the Italian firm, Colombo Filippetti. These are the Rolls Royce of electric piercing saws, being strongly built, with an alternator to control the speed of cutting and use normal size blades. 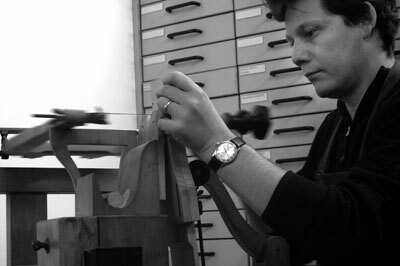 I have been using Colombo Filippetti for the past 15 years, in parallel with the marquetry donkey. There is one major disadvantage of the electric piercing saw, however: the cutting is almost continuous and slowing down the machine takes time, as opposed to the marquetry donkey that is fully hand-operated. As a result, cutting of marquetry by the electric piercing saw is not as sharp and precise as that from the donkey. I often have interns or new employees who have been trained on Colombo Filippetti machines and who confidently think they can produce the standard of work we do in my workshop using the electric piercing saw. Very quickly, they realise that while electric piercing saws have their place in the modern workshop, the resulting quality is no match to that it is possible to obtain on the marquetry donkey. Virtually every time I teach marquetry, a new convert to the donkey is born and colleagues teaching marquetry around the world say the same. In the past, marquetry donkeys were widely available in tool shops but the drop in demand during World War II has resulted in very few sellers offering newly made donkeys. Making your own donkey is possible but can be a time consuming and difficult challenge - between 3-8 weeks of work depending on ability - also requiring the help of a metal engineer for mechanical parts, and of course requiring a good workshop setup. Buying your own donkey is possible from specialist suppliers, including myself, and at a much lower price than a laser marquetry cutter or a Colombo Filippetti.